Peppermint with organic Almonds– a beautiful crunch with slivered almonds topped off with the refreshing taste of peppermint. A true heavenly experience that is sure to wake your taste buds up! Salty Almond: For all you salt lovers! 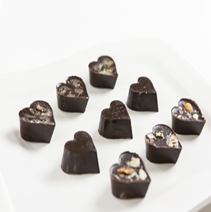 We sprinkle small chunks of sea salt over the chocolate almond indulgences to give a perfect sweet, salty combination sure to satisfy our salty tooth and your sweet tooth at the same time while providing you with essential nutrients! YUM! Ingredients: Cacao butter, vanilla beans, cacao powder, coconut palm sugar, sea salt, peppermint essential oils, crystallized ginger, raw almonds.